9 Now it is superfluous for me to write to you about the ministry for the saints, 2 for I know your readiness, of which I boast about you to the people of Macedonia, saying that Achaia has been ready since last year. And your zeal has stirred up most of them. 3 But I am sending the brothers so that our boasting about you may not prove empty in this matter, so that you may be ready, as I said you would be. 4 Otherwise, if some Macedonians come with me and find that you are not ready, we would be humiliated—to say nothing of you—for being so confident. 5 So I thought it necessary to urge the brothers to go on ahead to you and arrange in advance for the gift you have promised, so that it may be ready as a willing gift, not as an exaction. 10 He who supplies seed to the sower and bread for food will supply and multiply your seed for sowing and increase the harvest of your righteousness. 11 You will be enriched in every way to be generous in every way, which through us will produce thanksgiving to God. 12 For the ministry of this service is not only supplying the needs of the saints but is also overflowing in many thanksgivings to God. 13 By their approval of this service, they will glorify God because of your submission that comes from your confession of the gospel of Christ, and the generosity of your contribution for them and for all others, 14 while they long for you and pray for you, because of the surpassing grace of God upon you. 15 Thanks be to God for his inexpressible gift! I write this after participating in a worship service in a packed church on a Thursday afternoon. Yes, it was a funeral, but not a funeral of a celebrity (well, not in the usual sense) or of somebody rich and famous. The man who died at age 48 was born with an inoperable brain tumor and doctors said he wouldn’t survive the first year of life. And he did have some limitations — but oh, what he did with the life God gave him! I looked at my wife during the service and commented on how amazing it is that one person could touch so many people and bring forth the outpouring of love we saw in that church. This young man did not focus on his limitations (today doctors would probably advise that he not be given the opportunity to live because they would claim he would suffer from a low quality of life). Instead, he accepted the blessing of his original healing (as the tumor miraculously shrank), and then the trial of many hospitalizations and surgeries throughout his life. He loved God extravagantly, always giving trinkets of faith to everybody he met, wearing T-shirts with slogans witnessing to Jesus, and communicating via social media with Christians around the world (many of whom were probably unaware of the health issues he was dealing with). He was active in the local fire company and served at church community dinners and many other events, always smiling and sharing joy (and sometimes bad jokes). This is what stewardship is about. It is about finding how to use the life God gave you, and, instead of complaining about what you cannot do, looking for ways to bring light and joy into the lives of others. So Paul counseled the Corinthians, who, as we read elsewhere in the letter, were not especially wealthy or prominent. But that doesn’t matter. The joy of giving is not received in a tax deduction or in being appreciated, but rather in bringing glory to God. In the process, we are blessed by people who care for us and pray for us. Prayer: Thank you Father for creating me and giving me the gifts to bless others. Help me to see what I can do to nurture and support life, and keep me from focusing on my weaknesses or limitations. In Jesus’ name. Amen. Pro-life Action: How are you using your time, your abilities, and your resources to advance the pro-life cause? Can you participate in the March for Life or give somebody else the money to do so? Do you support Lutherans for Life with your gifts? Today’s devotion was written by Rev. Steve Shipman, STS. Rev. Shipman is a member of the NALC Life Ministries Team and lives in Dillsburg, PA. This year’s Advent devotions are written by the members of NALC Life Ministries. 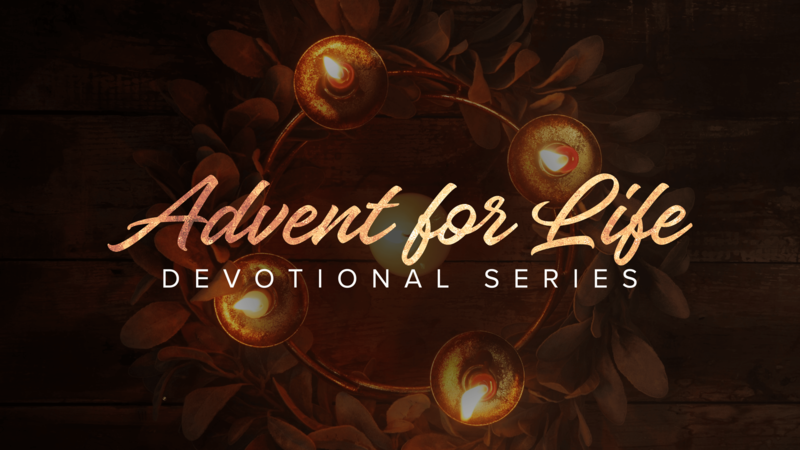 The devotional follows the daily Revised Common Lectionary for Advent and includes a Bible reading, commentary, prayer and pro-life action for every day until Christmas Eve. As we move through the season of Advent, Scripture reveals the anxiety of an unplanned pregnancy, as Mary and Joseph ponder this miracle and seek to understand who this precious child might be. This devotional examines our responsibility to protect all human life in light of Mary and Joseph’s protection of Jesus, the savior of the world. Our authors include Rev. Dr. David Wendel, Rev. Mark Chavez, Rev. Dr. Dennis Di Mauro, Rev. Dr. Cathi Braasch, Rev. Scott Licht, Rev. Sandra Towberman, Rev. Steve Shipman, Ms. Rebecka Andrae, Rev. Melinda Jones, Rev. David Nelson, Ms. Rosemary Johnson, Rev. Mark Werner and Rev. Steve Bliss. 32 As for the bones of Joseph, which the people of Israel brought up from Egypt, they buried them at Shechem, in the piece of land that Jacob bought from the sons of Hamor the father of Shechem for a hundred pieces of money. It became an inheritance of the descendants of Joseph. your renown, O Lord, throughout all ages. and have compassion on his servants. so do all who trust in them. 19 O house of Israel, bless the Lord! O house of Aaron, bless the Lord! 20 O house of Levi, bless the Lord! You who fear the Lord, bless the Lord! he who dwells in Jerusalem! 19 and taking food, he was strengthened. For some days he was with the disciples at Damascus. 20 And immediately he proclaimed Jesus in the synagogues, saying, “He is the Son of God.” 21 And all who heard him were amazed and said, “Is not this the man who made havoc in Jerusalem of those who called upon this name? And has he not come here for this purpose, to bring them bound before the chief priests?” 22 But Saul increased all the more in strength, and confounded the Jews who lived in Damascus by proving that Jesus was the Christ. 23 When many days had passed, the Jews plotted to kill him, 24 but their plot became known to Saul. They were watching the gates day and night in order to kill him, 25 but his disciples took him by night and let him down through an opening in the wall, lowering him in a basket. 26 And when he had come to Jerusalem, he attempted to join the disciples. And they were all afraid of him, for they did not believe that he was a disciple. 27 But Barnabas took him and brought him to the apostles and declared to them how on the road he had seen the Lord, who spoke to him, and how at Damascus he had preached boldly in the name of Jesus. 28 So he went in and out among them at Jerusalem, preaching boldly in the name of the Lord. 29 And he spoke and disputed against the Hellenists. But they were seeking to kill him. 30 And when the brothers learned this, they brought him down to Caesarea and sent him off to Tarsus. 31 So the church throughout all Judea and Galilee and Samaria had peace and was being built up. And walking in the fear of the Lord and in the comfort of the Holy Spirit, it multiplied.